2011 US reissue on Numbered Limited-Edition 180g LP from Mobile Fidelity from the original master tapes for a superior sonic experience. 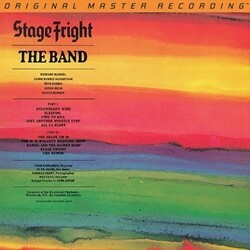 This analog edition of Stage Fright bursts with supreme tonal clarity and an airiness that brings the genius of Rundgrens preservation of high frequencies to complete realization. Even the fine textures of the hand drums on the stunning Daniel and the Sacred Harp come to light with microscopic detail Perfectly blended MoFi' s Stage Fright takes its place as the most balanced and punchy record in the Bands oeuvre. 1970 Set an Organic, Iconic Rock Landmark - In Special Textured Finish Gatefold Jacket. Record Shivers With Raw Emotions, Dark Confessionals, and Intense Singing. Half-Speed Mastered from the Original Analog Tapes: Transcendent Sound. As always, Mobile Fidelity half-speed mastered this numbered limited-edition 180g LP from the original master tapes for a superior sonic experience. 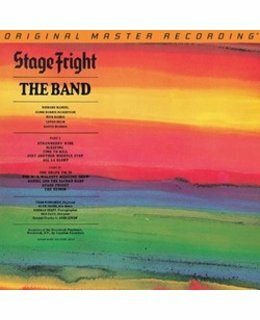 This analog edition of Stage Fright bursts with supreme tonal clarity and an airiness that brings the genius of Rundgren’s preservation of high frequencies to complete realization. Even the fine textures of the hand drums on the stunning “Daniel and the Sacred Harp” come to light with microscopic detail. Perfectly blended, MoFi’s Stage Fright takes its place as the most balanced and punchy record in the Band’s oeuvre.